In Sam Peckinpak’s war film (anti-war) Cross Of Iron we see the use of slow motion. The hyperbole of violence, normal in all war films, is brought to the foreground in Cross Of Iron by the repeated use of slow motion. The slow motion shots delay the conclusion of violence, robbing it of its ability to be a momentary action; the consequence of shooting reverberates longer than it normally does because of the slow motion style. And we as viewers are not permitted to ignore the ignoble truth of every bullet. The consequence and bloody violence is drawn out by the use of slow motion. However there is a danger that comes with the use of slow motion; namely that the violence obtains a sort of fetishistic stage where the audience intensifies its status as voyeurs enjoying the exploitation of blood letting. To avoid this the structure around the violence must inform the film’s position and communicate a sense of anti-violence and anti-war – because if that doesn’t then the film appears to enjoy and delight in the blood shedding. Cross Of Iron communicates its anti-war sentiment by highlighting the worn-down attitude of the German soldiers. The wish to allow the captured Soviet boy return symbolises. The fresh ambitious Prussian officer Hauptmann Stransky demands the shooting of the Soviet boy; his adherence to the rulebook indicates how broken and disaffected the other German soldiers really are. The lack of any clear distinctive military targets and aims also communicates a sense of confusion which supplements the feeling that all war is aimless slaughter. Because these elements are highlighted the slow motion retains the critique of violence. Conrad’s Heart of Darkness communicated a lost sense of rebirth (I will do a full side by side textual analysis of Heart of Darkness and Apocalypse Now later on in the year) and Coppola’s film also seems to communicate this. The change, or rebirth, of those who experienced Vietnam isn’t a heroic one that is portrayed after a tour of combat in many WWII films and even Westerns, it is a loss of self, a crisis and destruction of all things held to be honourable. Even returning home is impossible as Captain Benjamin L. Willard remarks “home… I knew it just didn’t exist any more”. Coppola, in Apocalypse Now, is explaining that every aspect of American culture has been infected by the loss of faith and loss of self because it journeyed into a heart of darkness either through the medium of television or through active combat. 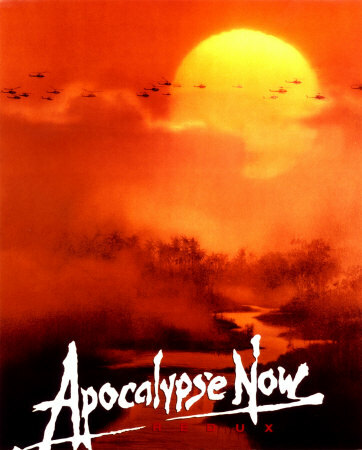 1Marsha Kinder, The Power of Adaptation in “Apocalypse Now”, Film Quarterly, Vol. 33, No. 2 (Winter, 1979-1980), pp. 12-20 p. 13. 2Marsha Kinder, The Power of Adaptation in “Apocalypse Now”, p. 14. This film is a landmark for several reasons, one that is impressive is how it re-evaluated and examined the western genre. An important symbolic happening in the film is the machine gun attack on the mexican army. The machine gun itself symbolizes, in this movie, the death of the ‘honourable’ combat that is a staple in many classic westerns. One-on-One shoot outs are replaced by instant mass carnage caused by mechanical guns that seemingly remove the last vestages of honour war and combat contains (Earlier Westerns tend to argue that shooting someone in the back or by surprise is a dishonourable act). A Fistful of Dollars indicates the switch in Westerns from honourable isolated individuals fighting for causes to mass-carnage where individuals attempt to play both sides off each other for profit. This movie, and the symbol of the new machine gun, indicates a darker more disturbing attitude to the heritage of the Western film genre and the myth of the West.